In the video clip: presentation of the various weather types. 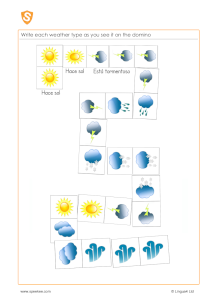 Download the weather images onto card or stiff paper, then cut them out to be used as 'dominoes' (with two of the images on each domino). Make sure you have several examples of each weather type. Pre teach the weather types with the images then practice them with a game of Weather Dominoes - the children have a selection of dominoes each and have to match the image on the last domino put down, while using the appropriate language. During the game take the opportunity to regularly ask the question "¿Qué tiempo hace?" (What's the weather like?). ¿Qué tiempo hace? ¿keh tyempoh atheh? What's the weather like?